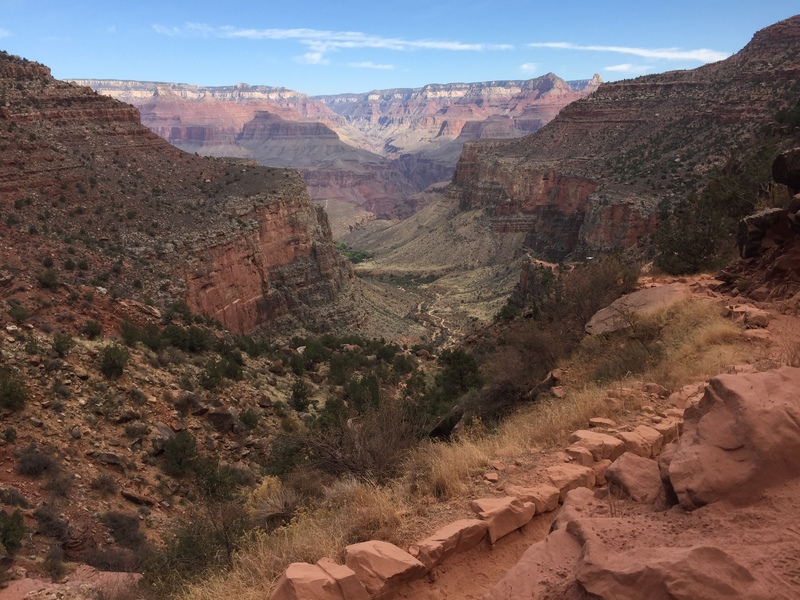 Briefly noted: P Cheung, et al. J Pediatr 2019; 205: 83-90. This study showed that a plasma biomarker for necrotizing enterocolitis (NEC), miR-1290, was very useful in a cohort of 301 neonates. Of 20 infants with miR-1290 > 650 copies/microliter, 15 were diagnosed with NEC. In those with intermediate values (220-650 copies/microliter) adding CRP (>1.58 mg/dL) allowed for a sensitivity of 0.83, specificity of 0.96, a positive predictive value of 0.75, and a negative predictive value of 0.98. The authors state that 7 of 36 infants had NEC diagnosed earlier by 8-32 hrs based on the availability of miR-1290 testing. My take: Biomarkers are helping us identify serious diseases more quickly and changing how we practice. Hopefully, work in this area will help us identify NEC sooner and improve outcomes. 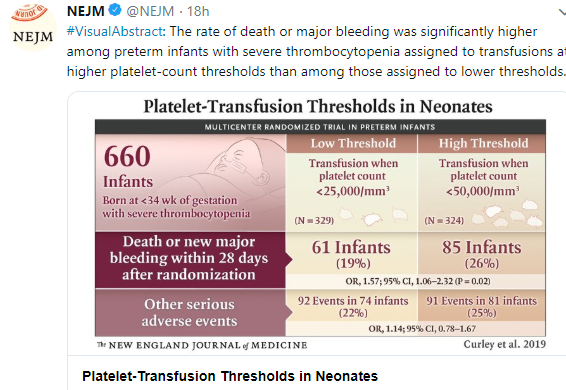 Below is a visual abstract indicating that transfusion for platelet count less than 25 K was associated with a lower rate of death/major bleeding that a platelet count threshold of 50 K.
Visual abstract indicates that most preterm infants do not need platelet transfusions as long as the platelet count is >25 K.
A recent study (BD Reed et al. J Pediatr 2018; 197: 97-103) showed that prenatal antibiotic exposure was associated with lower rates of necrotizing enterocolitis (NEC) or death. In this secondary analysis of a progressive study with 580 infants (<32 weeks) that were cared for in Level III neonatal intensive care units, the authors examined the outcomes of the neonates in relation to whether their mothers had prenatal antibiotics within 72 hours of delivery. Two-thirds of mothers received antibiotics w/in 72 hrs of birth, mainly ampicillin (37%) and azithormycin (26.4%). Most (~60%) of the mothers who received antibiotics received more than 1 antibiotic. In this cohort, NEC occurred in 7.5%, late onset sepsis (LOS) in 11.1%, and death in 9.6%. The combined outcome of any of these events occurred in 21.3% of study infants. Prenatal antibiotics were associated with a reduced risk of NEC (OR 0.28, CI 0.14-0.56), reduced risk of death (OR 0.29, CI 0.14-0.60) but not LOS (OR 1.59, CI 0.84-2.99). Thus, the first two outcomes were within the confidence limits but not LOS. The authors indicate that their initial hypothesis was that maternal antimicrobials (w/in 72 hours of birth) would increase the risk of NEC but in fact provided a 3-fold protection and reduced the risk of death. The effects presumably would be mediated by changes in the infant microbiome related to infant’s exposure to microbial environment at birth and/or transplacental passage of antibiotics. The authors note that their study did not consider mothers to be in the exposure to antibiotics group if their only exposure was antibiotics at the time of cesarean section due to limited time to effect neonate. 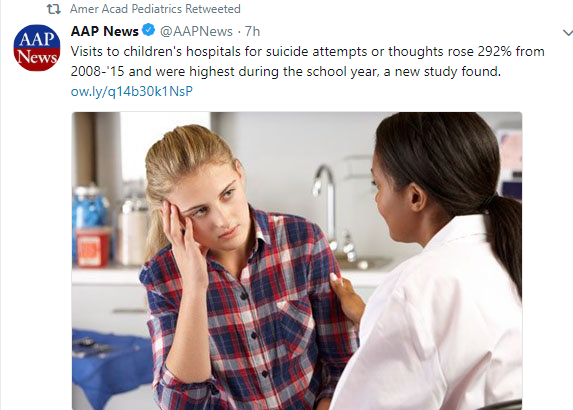 They did review this group and noted that if they were included in the exposure group that it would not have significantly changed the findings. 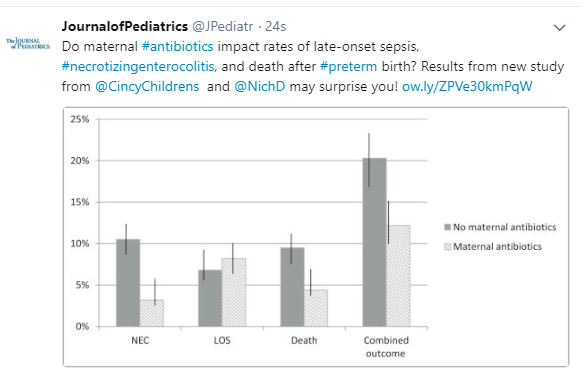 My take: This intriguing finding that NEC and death occurred less often in infant’s whose mothers received antibiotics prior to delivery needs further study as does the long-term effect. It doesn’t look like calprotectin measurement in newborns is going to be terribly useful for detecting necrotizing enterocolitis. A recent study (W Nakayuenyongsuk et al. J Pediatr 2018; 196: 98-103) showed a great deal of variability in the calprotectin values in their cohort of 62 infants. The highest subset scores for calprotectin was noted in the 1st week of life among preterm infants with gestational age >30 weeks. In this group, the mean value was 799 +/- 651 and the median value was 718. My take: This data shows elevated and highly variable calprotectin values in the neonatal period. There was also a trend towards higher values among those with postnatal age >30 weeks. A recent retrospective study (AF Kane et al. 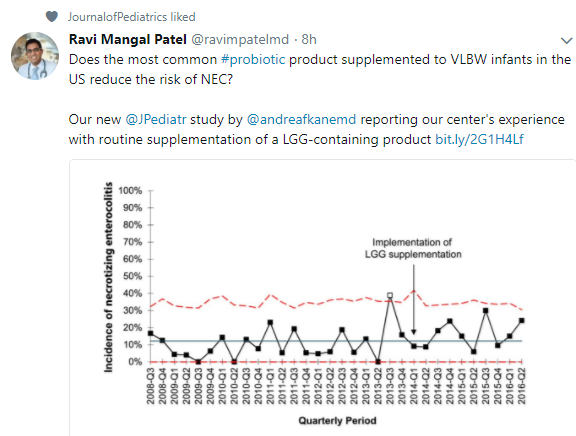 J Pediatr 2018; 195: 73-9) with 640 VLBW infants found that the probiobiotic, Lactobacillus rhamnosus GG (LGG), was associated with an increased risk of necrotizing enterocolitis (NEC). 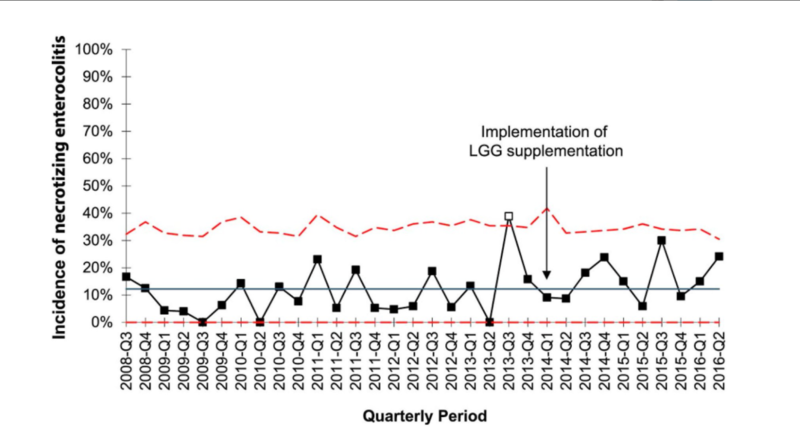 LGG supplementation was started at a median age of 6 days at a dose of 2.5 to 5 x 10 to the 9th CFU/day. LGG group had an aOR of 2.10 for developing NEC. LGG group NEC incidence was 16.8% whereas NEC incidence was 10.2% prior to institution of LGG. The authors note their findings are in contrast to findings from 38 randomized trials (10,520) which have found that probiotics lowered the risk of NEC. My take: This study reinforces the need for further studies to identify which factors and probiotic strains are likely to lead to reduced rates of NEC. My take (borrowed, in part, from authors): This data “confirm, strengthen, and expand on previous reports describing an association between inhibitors of gastric acidity and infections.” Thus, the risks of these medications is likely greater than the benefits in the majority of preterm infants. A recent study (A Riskin et al. J Pediatr 2017; 189: 128-34) indicates that routine testing of gastric residual volumes is not needed. In this study of preterm infants ≤34 weeks gestation 239 infants were studied prior and 233 studied after dropping routine checks of gastric residuals. While checking gastric residuals had been used to determine feeding intolerance and/or development of necrotizing enterocolitis, this study indicates that routine evaluation is not necessary. My take: This study challenged a common NICU practice and found that routine assessment of gastric residuals is not needed; selective checking of gastric residuals is sufficient. Vitamin D has garnered a great deal of attention due to concerns that deficiency worsens the outcomes in so many different conditions, including respiratory tract infections, inflammatory bowel disease, diabetes mellitus (type 1), multiple sclerosis, colorectal cancer, schizophrenia, depression, cardiovascular disease, hepatocellular carcinoma and other conditions. However, evidence of causation is typically inconclusive. For preterm infants, a study (Onwuneme C, et al. J Pediatr 2015; 166: 1175-80) notes an association between 25-hydroxy vitamin D (25OHD) levels drawn at 24 hours of life and acute respiratory morbidity. In this study, levels were also drawn at the time of discharge in the 94 preterm infants. In addition, maternal 25OHD) levels were checked 24 hours after delivery. These preterm infants were either <32 weeks gestation or <1.5 kg. The study population was predominantly Caucasian. Levels of 25OHD ≤12 ng/mL were associated with increased oxygen requirement (P=.008) and greater need for assisted ventilation (P=.013). The odds of requiring assisted ventilation were approximately 3-fold higher. The authors state that the baseline characteristics for the <12 group were similar to the <20 group. The authors note in their discussion that they favor supplementation with 400 IU/day which is in agreement with the American Academy of Pediatrics. Previous ESPGHAN recommendations were 800-1000 IU/day for infants. The authors note that 25OHD did not affect sepsis outcome. In addition, antibiotics during labor was virtually identical between the two groups. However, no data on CRP values were provided. Bottomline: This study shows an association between 25OHD values and several important neonatal outcomes. Whether 25OHD is a marker (eg. epiphenomenon) for these outcomes or whether low 25OHD contributes to these outcomes remains unclear.